In the case of conventional 3Hi Reversing Mills, the material (blooms and billets) is laterally moved utilizing a manipulator, sent into the next pass caliber and rolled. On the other hand, in the case of a shifting reverse mill, the material is kept at the same place while the rolling mill is shifted to the next pass caliber position for rolling. This prevents the generation of flaws and twists on the material due to handling. Furthermore, unlike conventional rolling mills that required a manipulator operator each at the start and end, complete automation can be achieved with the shifting reverse mill by the placement of a turner. (1) The rolling mill automatically shifts for each rolling pass and aligns the roll caliber with the pass line. 1 There is no lateral movement of the rolled material, so it is possible to reduce product warping and surface damage. 2 No device is needed to move the rolled material, and the table width can be minimized, giving the equipment an overall compact size. 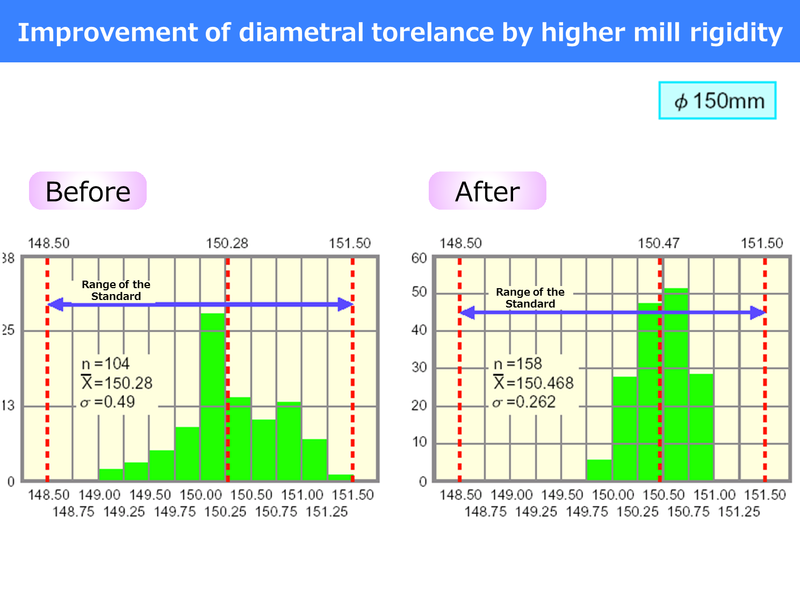 (2) There is a degree of freedom in selection of the number of rolling passes. 1 The number of rolling passes can be freely selected according to the rolling size and shape. From 2 to 12 rolling passes can be selected with the H-V shifting reverse mill, and 2 or 4 passes with the H shifting reverse mill. 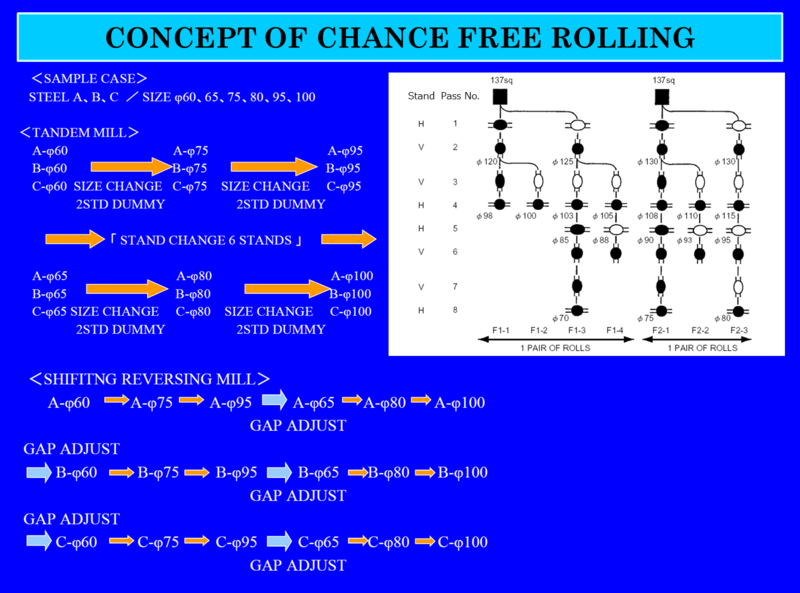 2 It can contribute to chance-free rolling that enables rolling at a number of sizes from a pair of rolls. (3) Measures have been implemented to reduce the time required for mold replacement. 1 Preparation of specialized grooved rolls for each size/shape in the roll pairs makes it possible to replace molds of different dimensions and shapes within each size range easily. 2 Mold replacement time is minimized by automation of housing replacement and roll replacement using a replacement cart and a backup housing. 3 Guides can be placed in guide holders in advance, making it possible to replace them holder and all.Guide position can be changed with a holder shift mechanism, both online and offline. (4) It is possible to automate rolling mills and minimize the workforce. 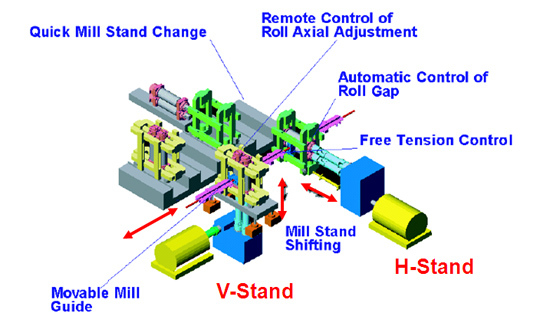 The stand moves for each pass, and rolling is conducted using specialized grooved rolls, thereby eliminating the need to stop the line to move the rolling mill or adjust spaces between rolls, making it possible to implement full automation and minimize the workforce needed for adjustments. Eliminating the lateral movement of rolled materials and enabling rectilinear rolling makes it possible to minimize the occurrence of product warping, twisting, and surface damage.Updating conventional 3Hi reversing mills will save space while realizing high efficiency. The reverse rolling and material handling (rotation) of blooms and billets are completely automated. By setting up the shifting stands for the Horizontal and Vertical stands in an H-V sequence and rolling in reverse, it becomes possible to carry out chance free rolling through optimal caliber placement. A variety of sizes can be rolled without the need to exchange rolls. 1 size roll in the H-V pass, 1 size roll in the H-V-V-H pass. A maximum of 4 passes in 1 roll family. A maximum of 8 sizes can be produced in combination with changes in the guide position.